Home/Did You Know....?, Skin Health/Did You Know ……? Did you know…What can water do for our minds, body and skin? It’s no secret that water intake is essential to our wellbeing. We have read it and heard it so many times from health-care professionals, parents, teachers and even friends. Somehow, however, the message that water is so important to our overall health just doesn’t seem to connect in our rational brain. The body is an amazing machine — it will send messages through your nervous system when something is off balance, just like the computer in your car will tell you to check your engine. Unfortunately, we often tune these messages out, pass them off as “normal” or “the joys of growing old”. It’s amazing how our minds will ignore discomfort for long periods of time until the body needs to go to drastic levels just to get your attention. It’s time now to understand WHY water is so essential to a balanced and healthy body. Water makes up to 70 per cent of your body’s weight. It is primarily stored in the dermis which is the lower levels of the skin, and is continually being released through the body to help move blood toward the cells for nourishment as well as moving lymphatic waste materials out. Water is required for proper fluidity throughout the body. This means movement. When a hormone is released, it requires fluidity in order to send the proper message to the proper system. It then needs fluidity for proper elimination after delivering its message — once the message has been successfully received a hormone will die, like a bee that has released its stinger. Water is essential for the nervous system. Messages that create thoughts and feelings travel along the nervous system to the brain, which then creates the appropriate reactions. Without water, this system becomes sluggish and the brain begins to shut down. The body gets tired, and fatigue and brain fog set in. The liver requires water in order to process the junk and eliminate it out of the body as waste. Without sufficient water, the liver isn’t able to release efficiently and it will hold on to waste until it can release it. Water is required for proper elimination of the skin as well. Skin cells are designed to reproduce every 28+ days. When a cell is damaged, it will force premature cell death and a fresh cell will be generated to take the old cell’s place. Without sufficient water storage, these sick, dying cells become stuck and trapped in the layers of the skin. Once the cell is dead and not moving, it literally rots and releases free radical waste among the living healthy cells. In turn, cellular breakdown occurs, creating premature and aggressive aging. These are just a few points on the importance of water intake. If you are experiencing frequent bathroom stops with proper water consumption, try adding a small dash of Himalayan sea salt (pink rocks in a grinder) along with some lemon, cucumber slices, or both. The lemon and cucumber will mask the salt in the water, but the salt will help draw the water to the dermal tissue and store it among your hyaluronic acid molecules. 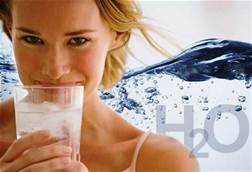 Hyaluronic acid is a molecule naturally found in the body and will hold 1,000 times its molecular weight in water. The salt will naturally draw the water to the “ground substance” through a process called chelation. Chances are with this small addition, you won’t be running to the loo so often. If you think your bladder can’t store so much water all at once, then try drinking one cup (250 ml) an hour. It really isn’t much when you think about it. Nowadays, a regular drinking glass is actually much larger than this — and we tend to fill this large glass with water and try to down it right away, and we’ll consider that one serving of water. If this sounds like you, then, yes, your bladder may be to small for that amount. Get back to reality and find a glass that is an old-school 250 ml size. Want to make that water more palatable? Add a little non-sweetened flavour like lemon, cucumber, or mint. You can also try drinking more herbal teas during the winter months to get that water intake your body needs. Finally, coffee is a diuretic. Yes, you need water to brew the coffee. But once the caffeine metabolizes inside your body, it increases your need to release water — not so good for those water stores. Limit your caffeine intake, or if you absolutely need more than one coffee a day, be sure to increase your water intake. For every coffee or non-herbal tea, add 2 cups of water. P.S. : Don’t forget about water that we find in our foods. There are plenty of veggies that help get those water levels on the rise — and they taste pretty fantastic. Although most people jump to the fruit aisles for water-loving foods, did you know that lettuces and cucumbers are made up of 96% water, while watermelon is actually lower at 92%? Fruits are delicious and contain plenty of vitamins, but they are generally also pro-inflammatory thanks to their higher sugar content. Challenge yourself to load up more on leafy greens, cucumbers, celery, green cabbage (which at 93% water is still higher than a watermelon! ), peppers, cauliflower, broccoli and spinach.